Following the Moto G6 and Moto E5 ranges earlier this year, Motorola is back with something slightly higher end, namely the Moto Z3 Play, and unlike those cheaper handsets this one supports Moto Mods. That means you can add the likes of a projector, a bigger speaker or a camera zoom to the phone, and it even comes with a 2,000mAh battery pack Moto Mod in the box when bought from Motorola’s website in the US. Other than Moto Mods, highlights of the Moto Z3 Play include its aluminum frame and glass back, along with minimal bezels around its 6.01-inch 1080 x 2160 Super AMOLED 18:9 display. It’s a fairly high-end look, but the phone lacks a 3.5mm headphone port. You get a dual-lens camera on the back, but the camera’s specs are more mid-range than high-end, as it’s a combination of a 12MP f/1.7 lens and a 5MP one that’s used purely for depth-sensing. Around the front there’s an 8MP camera and the Moto Z3 Play has a 3,000mAh battery, which is on the small side, but at least there’s that optional Moto Mod battery pack. The power looks middling too, as the Z3 Play is packing an octa-core Snapdragon 636 chipset and 4GB of RAM, plus either 32GB or 64GB of storage, a microSD card slot and Android Oreo. 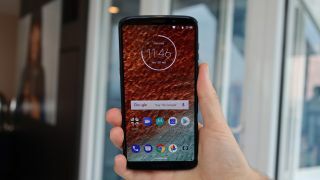 If you want something truly top-end from Motorola you’ll probably have to wait for the Moto Z3 Force – assuming such a phone even exists – but the Moto Z3 Play is priced appropriately, coming in at $499 in the US. International pricing and availability is yet to be confirmed, but that price converts roughly to £370/AU$650.